To search our website - click here. Procon Technology has searched all over for these value-for-money power supplies adapters. Please see prices below and email us regarding your quantity requirements or special application. In Australia, call 03-98306288 now to buy! OEM, wholesale or re-seller discounts are available. Meanwell, also provide industrial power supplies from 15W to 10000W, Battery Chargers (including UPS), DC-DC Converters, DC-AC Inverters and LED Power Supplies and Medical Approved Power Supplies! 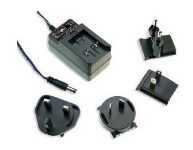 The 'Meanwell' GE range of 'plugpack' power supplies or travel adapters, with 'optional' interchangeable plugs for use world-wide, provide 12, 18, 24 and 30W of DC power in voltages 5V, 7.5V, 9V, 12V, 15V, 18V, 24V and 48V. 30W unit is now available with 12V, 15V, 18V, 24V, 36V, 48V. This "Green" range of power supplies is MEPS approved and meets the EISA 2007 (Energy Independence and Security Act) level VI. All have C-tick approval and Electrical Safety Approval*. All units operate on 110 to 240VAC input (50Hz or 60Hz) and provide an output on a 1m+ lead terminated in a standard 2.1mm DC plug. All come with a 2 year warranty. Australian plug provided... others optional! 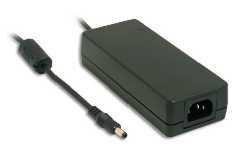 The 'Meanwell' GST range replaces the GS range of 'laptop style' mains adapters provide 18, 25, 40, 60, 90, 120, 160, 220 or 280 Watts of DC power in voltages from 5V to 48V. This "Green" range of power supplies is MEPS approved and meets the EISA 2007 (Energy Independence and Security Act). All have C-tick and Electrical Safety Approval*. They have fully-enclosed 94V-0 flame retardant plastic casings (no 'dangerous' vents), IEC AC input and over temperature protection (60W and over), LED power-on indicator and a 1m long lead with 5.5mm DC plug - except when more than 120W where 4 or 6 pin plugs are used. The GST120 replaces the AS-120P. All units operate on 110V to 240VAC 50Hz or 60Hz and have excellent MTBF (Mean Time Between Failure) rates. e.g. the MTBF of the GST25, GST40 and GST60 is over 600,000 hours! All come with Australian IEC mains lead (optional USA, UK or European leads available) and have a 3 year warranty. Now available... new GST range with higher energy saving (level VI), higher temperature (-30°C to 70°C on all models) and 3 year warranty! For more information - click here. Note, all power adapters imported into the USA now must meet Energy Rating VI. Click on the part number below to view the data sheet (PDF file) showing specs. PRICE LIST.........current until 31st March, 2019 . . .
GE18-v, 18W SMPS v = 5, 7.5, 9, 12, 15, 18, 24, 48V $36.00 $39.60 . GE24-v, 24W SMPS v = 5, 7.5, 9, 12, 15, 18, 24, 48V $36.00 $39.60 . GE30-v, 30W SMPS v = 12, 15, 18, 24V $40.00 $44.00 . GEM60I-v, 60W SMPS v = 5, 7.5, 9, 12, 15, 18, 24, 48V $80.00 $88.00 new! GST18A-v, 18W SMPS v = 5, 7.5, 9, 12, 15, 18, 24, 28, 48V $30.00 $33.00 news! GST25A-v, 25W SMPS v = 5, 7.5, 9, 12, 15, 18, 24, 28, 48V $36.00 $39.60 . GST40A-v, 40W SMPS v = 5, 7.5, 9, 12, 15, 18, 24, 48V $40.00 $44.00 news! GST60A-v, 60W SMPS v = 5, 7.5, 9, 12, 15, 18, 24, 48V $45.00 $49.50 . GST90A-v, 90W SMPS v = 12V, 15V, 19V, 24V, 48V $63.00 $69.30 . GST160A-v, 160W SMPS v = 12V, 15V, 20V, 24V, 48V $110.00 $121.00 news! GST220A-v, 220W SMPS v = 12V, 15V, 20V, 24V, 48V $150.00 $165.00 . GST280A-v, 280W SMPS v = 12V, 15V, 20V, 24V, 48V $180.00 $198.00 . 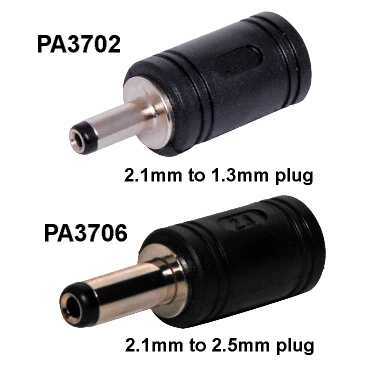 P0645, 2.1mm to 2.5mm Adapter for GE12-GE30, GS18-GS60 $2.70 $2.97 . PS-4100, IEC 0.5m mains lead... Australian/New Zealand plug $7.00 $7.70 . PS-4106, IEC 2m mains lead... Australian/New Zealand plug $8.00 $8.80 . PS-4140, IEC 2m mains lead... USA/Canadian plug $15.00 $16.50 . 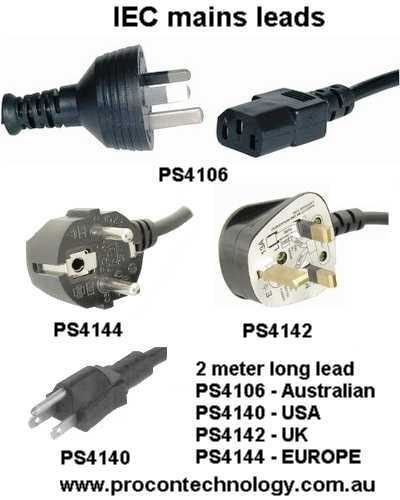 PS-4142, IEC 2m mains lead... UK/HK/Singapore/Malaysia $15.00 $16.50 . Click here to go to MeanWell Battery Chargers. Payment may be made by debit or credit card (AMEX, VISA or MASTERCARD) by PHONE or MAIL (or email at your own risk). AUD$ prices are Australian dollars. Note, these are EXPORT prices. For delivery within Australia please add 10% GST (use +GST column). For an order form that you can print out and mail to us - click here. Delivery charge within Australia $11 (trade & express bag orders - $16.50). More for discounted orders or large orders to WA, NT and remote QLD. Delivery to overseas destinations - P.O.A. (ask us). EX-GST purchases may only be made when the delivery address is outside of Australia. i.e. for EXPORT orders. Prices subject to change without notice. Operational tips: 1. Carefully check the voltage of your appliance before connecting and DO NOT switch on until you have also checked the following: (a) Check current requirement (the power supply should always have more current output than the device requires). (b) check the connection required (e.g. the plug type) and (c) the polarity. i.e. positive or negative connections. CUSTOMER COMMENT: 'Kingray (GME) amplifiers (terrestrial and satellite) and modulators are using 12V or 18V power supplies with 2.5mm DC connector. These are Australian made and very good... but their power supplies are seriously bad.' Procon Technology now stocks the GST18A and GST25A in 7.5V, 12V, 18V, 24V, 48VDC and can provide a 2.5mm adapter to solve this problem with Australian TV antenna and satellite distribution systems! The NEW GST range provides an ideal adapter for use in roof spaces, garages and sheds etc. where low and high temperatures are experienced! WARNING! Regarding some 'low-cost', 'no-name' switched mode plug packs and in-line or laptop style power supplies. One was returned (which we no longer sell) with the components inside melted due to high temperatures. Some of these 'cheap' plug packs have a maximum temperature of 35°C (for Australian conditions? ), a voltage tolerance of +/-8% and MTBF (Mean Time Between Failure) of only 30,000 Hours! It's hard to even get this data from 'no-name' manufacturers or 'who knows where they're manufactured' suppliers but Meanwell provide the most comprehensive data you'll find! The Meanwell plug packs have an upper temperature limit of 50 to 70°C (with derating)*, a voltage tolerance of +/-5% (down to 2% for higher voltages) and a MTBF of up to 711,000 hours. e.g. The Meanwell GS range of in-line power supplies over 90 Watt have OTP (Over Temperature Protection), active PFC (Power Factor Correction), a fully enclosed plastic cases without fans (spill a cup of coffee on a 'cheap' unit and watch the sparks fly) and the highest MTBF (Mean Time Between Failure) in the industry! AND, as with most Meanwell adapters, it uses an IEC320-C14 3 pole mains inlet with removable lead (that's the same power lead used on most computers) which allows the lead to be replaced easily if damaged or changed if using it overseas! So ... which make of power supply will you buy? *for 70°C operation at 240VAC (with derating above 40-50°C) see the GST range. "WARNING", we cannot stress enough how important it is to buy a power adapter that complies with Australian electrical authority regulations. All adapters have Australian Electrical Safety Approval which means they are approved for use in all Australian States and New Zealand. You wonder why it costs more for these power adapters? It costs up to $10,000 for electrical authority approval !! We cannot emphasis enough how important this issue is - click here. Some FAKE Meanwell power supplies have also been sold by overseas suppliers - BEWARE! Always purchase from an authorised Australian Supplier! MEPS (Minimum Energy Performance Standards) is a mandatory Australian and New Zealand Government initiative effective from December 1, 2008 (implementation date in Australia), to eliminate low efficiency external power adapters from the market and encourage the use of high efficiency power supplies (performance MARK V or VI). Many of the existing plug packs on the market today will not comply with the new AS/NZS 4665-2005 standards. Also called GEMS (Greenhouse and Energy Minimum Standards). For more information - click here. Disclaimer: The above specifications are subject to change without notice. Please ensure the suitability of these products for your application before purchase.